The photograph was taken at Christmas December 1965 and shows the display of Christmas turkeys ready for customers to buy for the festive season. It also shows me, on the right, with John Matthews, on the left, who also worked in the shop. 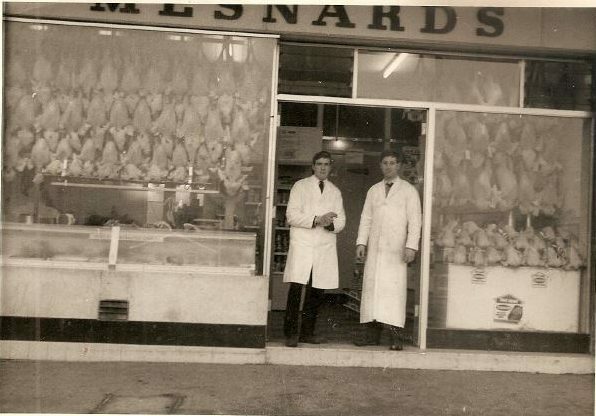 My father opened the newly built shop in 1960 together with B. Curtis Greengrocers next door. The two shops were built by Strachan Builders, Ben Curtis’s father in law. My father moved his business to South Green after having had his shop in Laindon compulsory purchased by the Basildon Development Corporation which was building the new town in the 1950s/60s. He sold the business in 1966 to Kingston’s, the butchers, who had many branches stretching from East London into Essex; the business is now owned by the Belcher’s. This may be wrong but is there any link with “Maynard’s” butchers in Frinton ? This was my a great uncle ? ?